Hi! I'm Maxine Kwok-Adams a 1st violinist with the London Symphony Orchestra here to help you win a successful audition! 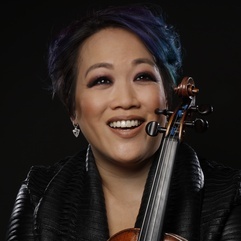 Hi, I’m Maxine Kwok-Adams, ARAM and I’ve been a member of the LSO 1st violin section since 2001. In that time I’ve heard hundreds if not thousands of auditions for the violin section as well as for the LSO string scheme which I mentor. Let’s face it, no one loves doing auditions, I certainly didn’t! It’s a totally different kind of preparation to giving a recital or performing a concerto, to have to give your very best in only 10-20 minutes. I’ve heard so many fantastic violinists who sadly didn’t get trials/jobs because of small mistakes that I could help you with very easily. I also like to focus on orchestral excerpts that come up in auditions or the trial period. I can be seen on the LSO YouTube channel performing in duo violin concerts, giving masterclasses and interviewing violinist Nikolaj Znaider about the pitfalls of the Tchaikovsky concerto. I have been invited to contribute articles and give talks for the Violin Channel, the Strad magazine and Bachtrack on the subject of auditions so I know I can help YOU get the job you have been dreaming of! No reviews yet. We offer a money back guarantee if you are not happy with your lesson, so why not try a lesson with Maxine?